This is my adaptation of a recipe attributed to Tyler Florence on Food Network. The skin is tangy, the flesh is flavorful and succulent. Check out side dishes that I added for a small but choice Christmas Menu 2013. Rinse the duck in hot running water and then use paper towels to pat it dry. Remove any obvious deposits of fat around the neck and cavity openings. Place ginger, garlic, scallions, star anise, and tangerine peel inside the cavity. Sew or skewer the cavity if you want the duck to look whole. Mix together the five-spice powder and salt, and rub the mixture all over the skin of the duck. Fold the wings in on themselves and tie the legs together loosely for presentation purposes. Place a rack into a roasting pan and pour in enough water to come up to the bottom of the rack. Place the roasting pan on the stove top and heat the water. Before the water starts to boil, place the duck on the rack breast-up and cover the pan tightly with aluminum foil, leaving just a small opening at the end for steam to escape. When the water boils and steam is plentiful, turn the burner to low so as to simmer the water and steam the duck. Steam the duck for 45 minutes, checking every 15 minutes or so to make sure there is still enough water and it is still simmering. Try to do this by just monitoring the steam output and feeling or hearing bubbling. If necessary, add more boiling water into the pan. While the duck is steaming, place the balsamic vinegar, soy sauce, and stevia into a small saucepan and bring it to a boil, then simmer it for about 15 minutes, until the foam that forms begins to rise up the sides of the pan. Keep this basting sauce warm. Heat the oven to 190°C (or 375°F) for subsequent roasting of the duck. When the duck is done steaming, take off the aluminum foil and place it upside down on the counter. Lift out the rack holding the duck and put it on the aluminum foil. Pour all of the water out of the roasting pan. Replace the duck into the roasting pan, using the aluminum foil now as a liner for the pan because the basting sauce will caramelize in the bottom of the pan. 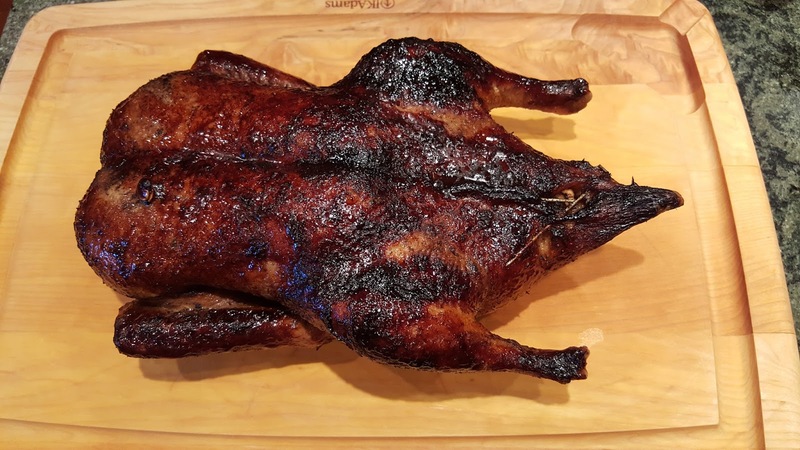 Using a spoon or soft brush, cover the skin of the duck on all sides with the basting sauce. Place the duck into the heated oven and roast it for 1 hour. The duck is done when the legs wiggle easily or the internal temperature is 70°C (or 160°F). long, and almost overflowed the pan. 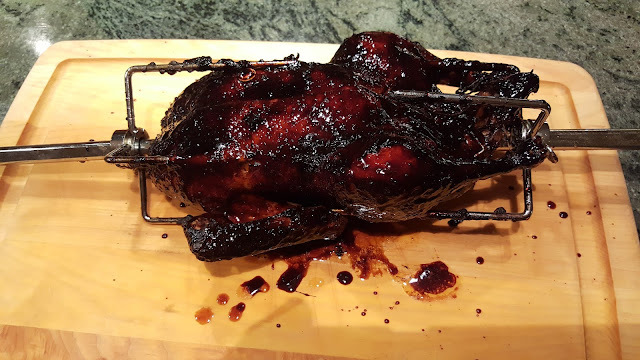 Our daughter and son-in-law bought a rotisserie attachment for the gas grill and last time I made this duck they roasted it on the rotisserie. Delicious! I was recently in Brooklyn for a few weeks and one day my husband called from Kaua'i to tell me that he had found frozen ducks at our local Costco store. He said he bought one immediately and put it in the freezer for when I returned. By the time I got back he had bought another one, and subsequently we bought one more. This week there were no more ducks; all sold, and we don't know whether we will ever see them there again. This is the way we have learned to buy things on this small island in the middle of the Pacific Ocean. If it is in the store and you want it, you get two immediately. You never know when the streak of luck will run out.